The Accidental Locavore makes this recipe a lot! It’s a great recipe for cooking chicken in your microwave. Quick, easy and delicious, you can have dinner on the table in 30-45 minutes. With a few exceptions (ginger, cumin, and salt) everything can be sourced locally–I used my own yogurt. This feeds two hungry people with leftovers for lunch. I chop the ginger, chiles and shallots in my mini-processor, but you can chop by hand. Heat the oil in a microwave-safe casserole uncovered for 2-3 minutes. Add chicken and toss to coat. Add 1/2 cup yogurt (reserve the rest for later), ginger, shallot, chiles, mint and 1/2 of the cilantro (reserve the rest) and salt. Mix well. Cook, covered, in the microwave for 10-15 minutes until the chicken is cooked through. 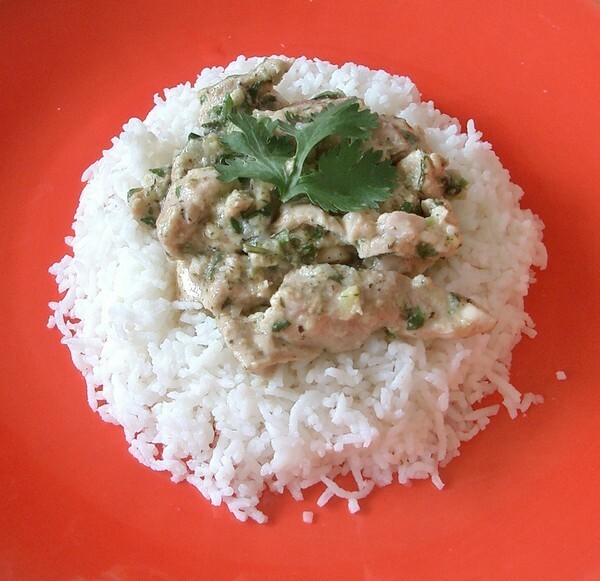 When the chicken is cooked through, add the remaining yogurt and cilantro and the cumin. Taste and check for seasoning. Cover and let rest for 3 minutes. Serve and enjoy! My verdict: This has become a staple in my house. It’s pretty fast and delicious! If you can eat nuts, the original recipe called for 2 tablespoons coarsely chopped walnuts, which add a nice crunch. To make it really creamy, labne is great for this, otherwise use a good Greek yogurt. I like brown basmati rice with it, but it takes about an hour to cook. Otherwise regular basmati is fine or the quickie packets when you’re feeling lazy. I usually serve this with broccoli steamed with lots of sliced garlic, curry powder and lemon juice. Sauteed spinach is another quick alternative. Next post: Make Your Own Bacon? Do It Yourself: Bacon, Mayonnaise, and More.